"The Tigress BC offers women a big mountain charger that is lightweight for backcountry use yet full of high-speed energy. A great ski for crossing over between backcountry and area skiing, the Tigress BC uses Vektor 8™ Carbon Fiber to maintain torsional rigidity while keeping weight down. While excellent on edge in tricky sections and for area skiing, the Tigress BC loves charging down wild faces with mixed conditions and deeper snow." The description Dave "Mazz" Mazzarella puts on the Tigress BC is pretty accurate. The Tigress BC shaves some weight off its standard construction sister, but maintains a really solid, responsive and strong all-terrain ski with impressive edge hold and plenty of energy in a stable platform...with skin notches to boot. The Tigress BC falls into the directional category of its 110mm waisted class since it has significant camber throughout the midbody, and it excels at covering mixed-surface conditions with complete stability and predictablity in a spunky, energetic platform. It really comes alive at moderate speeds, then has a surprisingly high speed limit for a ski labeled as "Back Country". The Tigress BC inspires confidence when the conditions are all over the map, always seeming to have grip when you need it, and floatation when you want it. The only limitation seems to be a bit of balkiness in the tightest Eastern tree conditions unless you have your speed up a bit (22 meter radius and only moderate tip rise). The Tigress BC is a great choice for lighter weight skiers looking for a 110mm class ski that prefers to hold a line with solid confidence rather than surf and smear across the snow. The harder you ski it, the better it goes, but it never feels bossy or abusive...more encouraging the skier to take an athletic approach to the ski rather than a passive ride. Nice work, inspiring ride, and beautiful to look at. Dave Mazzarella ("Mazz") creates an unusual, and somewhat exotic construction of his skis by using a proprietary hardwood core (we think Paulownia wood may be involved...but can't confirm this) with extremely hard black walnut sidewall/edge supports. 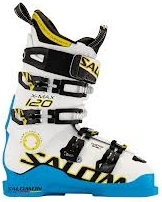 This creates a torsionally strong ski with good transfer of energy to the edges (SkiLogiks often have pretty impressive edge hold compared to other skis in the same category). The "Vector 8" composite fabric is a mix of fiberglass and carbon laid above and below the wood core. The "Black Magik" bases are carbon-infused, sintered material sourced from Germany. Ski manufactured in China. Measured Weights: 1474 grams and 1483 grams. SkiLogik makes some of the most attractive skis in the business, with gorgeous, hand-made inlaid wood topsheet artwork. The fit and finish was very, very good (essentially flawless). A new finishing process with new machines has been put into the production line at SkiLogik in 2015, and we skied it "out of the box" as-is and found it was the best finish yet on a pair of SkiLogik skis with excellent base structure and edge preparation. The hand flex on the Tigress is medium-stiff throughout, softened a bit at the tip and tail, and torsionally strong. The ski feels damp and resistant to vibrations. Mounting bindings found the screws to tighten firmly and securely in the wood core and laminates, locking down with authority...more than many other skis we have mounted. Skin notch on the tails. Geometry is moderate, not radical, looking like a 22m radius ski, even in this 166cm length. Feels like it wants to run. The Skilogik Tigress BC has a relatively wide, 22 meter radius, and prefers larger, GS-like turns on hardpack rather than chop-and-go, tight SL turns. When the edge is engaged and pressured, it has a surprisingly strong grip along its edge, and delivers some impressive carving prowess, especially if you power it along it entire length. The Tigress BC only has a hint of wash-out in the tip or tail on hardpack if you try to get it to crank tighter than its design radius, but only a little, maintaining a secure grip underfoot to change direction or hold a line. Vibration and surface buzz underfoot is essentially non-existent with the construction materials Dave Mazzarella has put into this design, even on very hard surfaces. Boilerplate can be a little slippery if you don't purposefully engage the edge into the surface, but compared to similar skis in this category, the Tigress bites with authority other skis lack, putting it pretty much at the top of the hardpack grip food chain for this type of ski. The hardwood black locust sidewalls really do allow this ski to transmit pressure directy to the edges nicely, with solid security. Highest speeds on hardpack can show a little looseness in the forebody, but if you keep the ski on edge, this feeling disappears. The Tigress really excels in cutting deliberate paths through mixed conditions. Both intermediates and experts found the Tigress BC traverses oddly surfaced and mixed-consistency snow with essentially zero effort. The more you drive it, the more it likes it, even in this "Back Country - BC" version. The Tigress BC does not show any darty, unexpected or abrupt behavior in mixed conditions, preferring to stay on-course until told to change directions. Stabilty and predictability are two words to describe the Tigress BC's behavior in odd snow conditions, but with a sparky, energetic zing when you load the ski and release it. This is very handy when mashing through weeds and brush off-piste at speed, which the Tigress BC seems to excel at doing. This design is an excellent choice for intermediates looking to make the jump to higher levels of performance and expertise in mixed snow conditions with larger-radius turns. The tightest tree-filled trails revealed the slightly longer radius (22 meters) preference of the Tigress BC than some skis, asking the pilot to command the ski to crank a bit tighter, rather than just tip it over into a higher banking/edging angle, but it never became balky. Get it into more open terrain, and it sings with lighter weight skiers who might normally be bullied by normal "charging" skis. In mixed terrain, the Tigress BC is not just for women, but any lighter-weight skier. The Tigress BC glides through larger radius bumps smoothly and with authority, much more than many "BC" skis which can seem to feel like they are folding up sometimes. The nicely balanced flex of the Tigress BC allows bumps to be traversed head-on with a reliable platform with plenty of power on tap to bound up and over obstacles when needed, and pivot quickly to change directions. When the bumps get a bit tighter, the Tigress BC shows its 22 meter radius preference, becoming a little stiffer, but never difficult. No hangup in the tip or tails in the tighter bump troughs. If you attack the bumps, the Tigress respondes. If you passively ride through the bumps, it might feel a little stiff, but no different than any frontside-oriented resort ski. Overall, a nice balance for a ski with a charging character under the covers. The Tigress BC cuts some very comfortable, very fun lines through powder with great predictability and stability, tending to lean toward the directional powder behavior rather than the super smeary, surfy personalites. If the powder has any hint of crust or windpack within its depths, the Tigress essentially ignores it, staying right on course, which we really like. The faster you go, the more surfy it can feel, making high-speed runs in soft snow really fun. We found essentially zero deflection or darty behavior in powder, with plenty of power to crank through variable depths with solid confidence. In some ways, the Tigress feels simlar to the Howitzer in this behavior, only in a smaller, lighter chassis. You can take the Tigress BC out to get the early morning powder, have a blast, and stay on the same ski for the afternoon to slay the skied-out material. Solid gripping along its entire length, with great energy out of the turns. Surprisingly nimble, even when pressed into a tighter radius than its design dictates. Capable of unusually good carving ability on packed powder or corduroy surfaces. Ignores mixed snow conditions. Does not seem like a dedicated back country ski...more like a lightened resort ski which can do backcountry really well. Not ultra-light, but stronger than ultra-light BC skis. Directional behavior in powdery situations with zero deflection from subsurface materials. Fun, athletic, rewards a driver rather than a rider, yet maintains a great balance between performance and fun. Nothing. Great as-is for what it's intended for. Probably offer a 182 cm version with the same proportions. Great all-terrain ski for 3 dimensional snow, with class-leading hardpack grip. Likes larger-radius turns and open terain, but can be nimble in tighter terrain when asked. Could be an excellent daily driver out West or for storm conditions in the East. Rewards an athletic skier, but is not burly in the least. If you want to ski tight, tree-filled terrain, keep true to your normal size or downsize one. It has a relatively long effective edge feel for its intended purpose, and delivers a more directional than surfy ride.